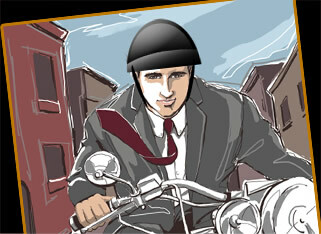 How many people know that motorcycle insurance is nothing like car insurance? Most drivers and motorcyclists, and even some insurance agents, are surprised to hear me say that because they don’t understand insurance. 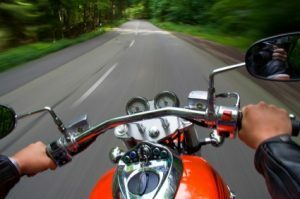 I know insurance because I have represented many motorcyclists in the last 20 years, and in most cases, the people I represented had insufficient insurance to protect themselves if they have a collision. 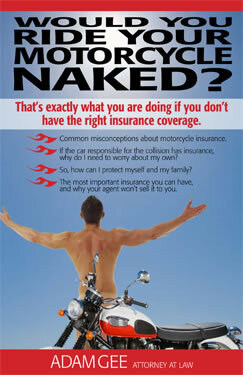 I know insurance because I am a motorcyclist, too. I recognize the dangers we all face from motorists who drive like we don’t exist. In a world of distracted drivers, we are invisible too often. People who drive cars and other vehicles are covered by the no-fault insurance system, meaning that your insurance company will pay your medical bills and lost earnings if you are involved in a collision, regardless of who was at fault. No-fault insurance, unfortunately, doesn’t cover motorcyclists. Combine that factor with many motorcyclists taking pride in buying the least expensive insurance policies they can find, and you have a recipe for financial disaster in a collision. 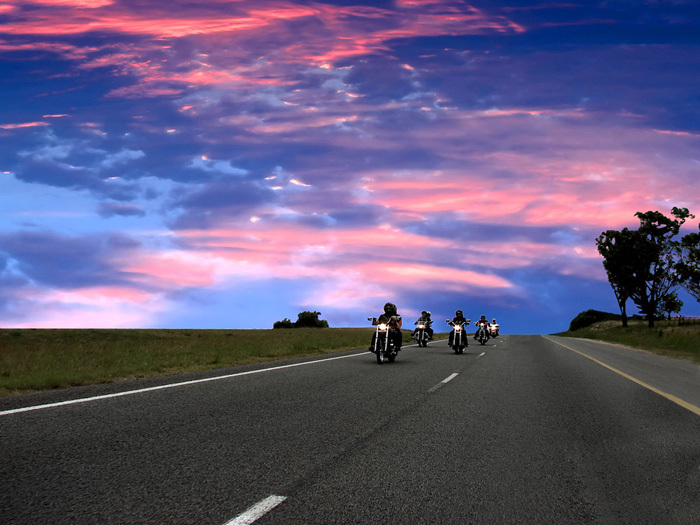 There is a reason motorcycle insurance can be inexpensive in many cases: it doesn’t cover anything! Motorcyclists need to get educated and invest wisely in their insurance. They need to recognize that the basic motorcycle policy usually only covers somebody else the motorcyclist hits – that’s your liability coverage – but a basic policy may not be enough to protect a motorcyclist and their passenger if they are injured. The biggest mistake motorcyclists make when buying insurance is spending extra money on collision coverage for the motorcycle but not protecting themselves by buying more liability and Supplemental Uninsured/Underinsured Motorist (SUM) insurance, and medical payments coverage. I advise motorists to be sure they have at least $250,000 in SUM and liability coverage. New York State recently required insurance companies to make sure both coverage limits are the same amount in your insurance policy. In the past, many insurance buyers spent less on SUM coverage than liability to save money, which was a bad idea. SUM protects you and your family if you are in a collision with an underinsured or uninsured motorist. If your limit is $250,000, then that is the most you can recover from your insurance company after a collision. Liability is bodily injury and property damage coverage that protects you if you are involved in a collision where you are at fault. There is also medical payments coverage, which can help pay your medical costs if you and your passenger are injured. It typically covers items like health insurance deductibles, co-pays, dental expenses, prescriptions, and home care. It would be a supplement to your personal health insurance that you pay for yourself or you receive through your employer. Medical payments coverage protects you at the time of your collision. If someone else is at fault, yes, they will ultimately be responsible, but you can’t make them pay your bills as they are coming in. If someone else is determined to be responsible for your collision, it may be one, two, even three years before their insurance company sends you one big check. Medical payments coverage helps you pay immediate bills until your case is resolved. This coverage takes the place of no-fault insurance for motorcyclists. If you have good health insurance, you might only want to get $2,500 or $5,000 in medical payments coverage. But if you have poor or no health insurance, I recommend at least $10,000 in coverage. One more point: if you are a motorcyclist without any health insurance, I recommend you get insurance today or stop riding until you do. All motorcyclists should have health insurance. You can learn more about motorcycle insurance by requesting my free book “Would You Ride Your Motorcycle Naked?” Click here to request it. This entry was posted in Local News, Motorcycle Accidents, Motorcycle crashes, Motorcycle Helmets, Motorcycle Injury Cases, Motorcycle Insurance, Motorcycle Laws, Motorcycle Safety, New motorcyclists, Uncategorized and tagged accident attorney, accident lawyer, Adam Gee, Adam M. Gee, American Motorcyclist Association, Motorcycle, motorcycle accident, Motorcycle helmet, motorcycle safety, Motorcycling, new york motorcycle, New York motorcycle attorney, new york motorcycle attorney adam gee, new york motorcycle crash, new york state motorcycle laws, NY accident attorney, NY accident lawyer, NY Motorcycle Lawyer, PA motorcycle accident attorney, PA motorcycle accident lawyer, PA motorcycle lawyer, Pennsylvania, Pennsylvania motorcycle accident attorney, Twin Tiers. Bookmark the permalink.